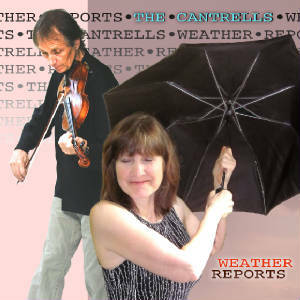 The Cantrells "Weather Reports" released July 2016! Welcome to The Cantrells' Web Site. Download "Goodbye Cool World", listen to songs, watch videos, order CDs, check the tour schedule, join the mailing list, or contact The Cantrells. "They blew my boots off..."
"Two first-rate musicians come together like a rainbow--many colored and splendidly joined. What a pleasure! Do yourself a favor and listen up." "Emily's is a beautiful voice, among the best on the scene. Al succeeds where many other 'super pickers' fail." "She sings like an angel, he plays like the devil. Al's fiddling is superb." "Emily Cantrell is one of my favorite singers. She could sing from the phone book and I'd be convinced. Al can fiddle and pick with the best." "Who are The Cantrells and what do they do?" The Cantrells in Wikipedia, "playing the straws, or fiddlesticks"